The number of two-wheelers in India have risen at an alarming rate over the past few decades. With this rise, the rate of accidents has also skyrocketed. Taking this into consideration, the Government of India introduced a rule under the Motor Vehicles Act, 1988, making it mandatory for all vehicle owners to have at least a third-party insurance policy. There are a number of insurance providers in India that offer two-wheeler insurance policies in Vadodara. 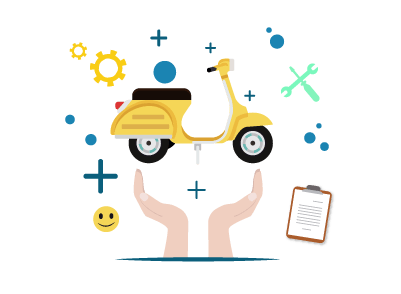 Finding a suitable insurance policy for your two-wheeler in Vadodara can be a difficult task on account of the abundance of policies available from different insurers in the country. The best two-wheeler insurance plan differs between customers and will be relative to your requirements, the coverage you want and the premium you are willing to pay. Some of the popular insurance companies in Vadodara that offer motor insurance for two-wheelers have been listed below. You can call the customer care to locate a garage near you. Log onto the official website of your insurance provider. You should be able to find an option to locate network garages. Enter your location to see garages near you. Garages within the network of the insurance company will offer cashless settlements to policyholders. There are a number of other benefits associated with cashless network garages. Fast approvals - Getting approvals on cashless claims are usually done within 24 to 48 hours. Less Paperwork - There is minimal involvement required by the customer. The garage will handle the paperwork with the insurer. Direct Bill Settlement - When you choose cashless settlements, the insurance company settles the bill. You will not be required to pay the money upfront and collect it later from your insurance provider. You only need to pay for what is not covered by your policy. Minimal Hassle - With reimbursement claims, the customer is required to visit the branch or meet the agent, submit documents and collect a reimbursement. With cashless claims, the customer can contact the insurance company through the customer care. Once the claim is approved, the garage and the insurer will handle the rest between themselves. Quick Settlements - When the bike is ready, the settlement of the bill is handled between the insurance provider and the garage. The customer is not required to collect and submit documentation and wait for a reimbursement. With so many options in the market, finding a suitable two-wheeler insurance plan can be a difficult task. There are a few important things to bear in mind while purchasing an insurance policy for your bike. Premium Rates - To purchase the plan, one must pay a premium amount. You need to look at your options of premium amounts, premium payment frequencies and terms. Generally, for a two-wheeler policy, you will be required to pay a single premium for an annual policy term. Plan Protection - With two-wheeler insurance, there are two options available: liability-only policy or a comprehensive package. With a third-party liability policy, only damages, injury and death caused to a third party will be covered. If you choose a comprehensive package, then you will also be covered for own damages. Settlement Options - Cashless settlements have a number of benefits in comparison to reimbursement claims. If your insurance provider offers cashless settlements, you will not be required to pay from your own pocket for the repairs. Cashless claims settlements save a lot of time, reduce the hassle and own expenses. Plan Tenures - Terms available on two-wheeler insurance are usually between 1 year and 3 years. When you opt for a longer term, you will be protected against rising premiums on third-party insurance as declared by the IRDAI from time to time. Deductibles - Deductibles is the amount you will have to pay in case of a claim. If you choose a 10% deductible, the insurance company will pay only 90% of the insurance claim. A lower deductible will increase your premium, while a higher deductible will reduce it. No-Claim Bonus Options - A no-claim bonus (NCB) is given to customers who do not make a claim during the policy period. The NCB is a discount on premiums when the policy is renewed. NCB is 20% for the first claim-free year and subsequently increases to 25%, 35%, 45% and 50% maximum. NCB cannot be transferred between policyholders. Maximum Claim Limit - Insurance providers will pay only a certain limit in damages and liabilities. For death caused to a third party, there is usually no limit. For claims on damage to third-party property, the insurance amount is capped at Rs.1 lakh. When it comes to comprehensive policies, the limits will depend on the premium paid, the sum assured and the coverage opted for. Exclusions - Under certain circumstances, the insurance company will not be liable to pay any claims. Some of the common exclusions of two-wheeler insurance plans are driving without a valid licence, driving under the influence of alcohol or drugs, damage due to war, terrorism or nuclear-related incidents, consequential losses, gross negligence in case of theft, and so on. There are certain legal procedures that must be fulfilled when you sell your bike. To make sure that in the future you will not be connected to any liabilities that may arise, you need to transfer the ownership name of the vehicle to the new owner. You can do this paying a visit to the Regional Transport Authority (RTO). Inform them of the sale of the vehicle and request to transfer the name. You can then apply for a No Objection Certificate (NOC). They will make the transfer. Intimate the sale of the vehicle to the insurance provider and request them to transfer the name of the policy to the new owner. The company will check if he meets the eligibility requirements and will require some documentation and details from the new owner. If you have not made a claim on the insurance policy, you can apply for a NCB certificate. The no-claim bonus on your policy will remain in your name as it is not transferrable to another person. You can then avail the NCB on any new motor insurance policy that you may purchase. Once this is done, the insurer will transfer the policy to the new owner of the vehicle. Transferring insurance policies ensures that you retain your NCB, while reducing the hassle of closing the policy. It could also helps fetch a better second-hand price on the vehicle.